The girl simply turns up one day and gets into the back seat of the 1943 Rikuo. She doesn't seem to have a name, but then nobody else does, either. The driver and the passenger drive away without even speaking to her, and that's how they come to be together. A little further down the road, they run into Suzuki, so called because that's the name of her machine, and they agree to conduct a cross-country race all the way to Nagasaki. Winner gets the other bike. 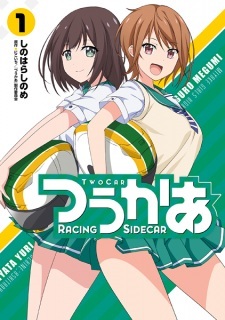 Shinohara's "Two Car" is mostly about this race, which is an odd race in that nobody much seems to want to win. The driver and the passanger have devoted their lives to racing and winning with their customized and rebuilt Type 97, and Suzuki identifies intimately with her bike, yet they keep stopping to help each other along the road, as if the road would be unbearably lonely if that other car weren't sometimes in view. What I liked about "Two Car" was the sense of life that occasionally sneaked through, particularly in the character of Suzuki. She is the only character who is fully occupied with being herself (rather than the instrument of a metaphor), and so we get the sense we've met somebody. That, and some of the racing and road scenes, and the visual texture of the manga, makes it worth reading.